Our office was established in 1985 and is the only center in Maryland offering a comprehensive approach to the use of ultraviolet light and selective laser treatment for the treatment of skin diseases such as psoriasis, eczema and vitiligo. Sunlight has been known to have a beneficial effect on certain skin disorders, in particular psoriasis, for many hundreds of years. In the last century, it was discovered that the ultraviolet portion of sunlight was responsible for this therapeutic effect. Phototherapy (often called light therapy) involves exposing the skin to an artificial source of ultraviolet light on a regular basis under medical supervision for therapeutic purpose. Many skin disorders are characterized by localized inflammation in the skin that is mediated by the immune system. Ultraviolet light reduces the inflammatory response as well as suppresses the immune system in the skin. These are felt to be the primary mechanisms of action of phototherapy in skin disorders. Our office specializes in the use of ultraviolet light for numerous skin disease including psoriasis, eczema (dermatitis) and vitiligo. PUVA Therapy Ultraviolet radiation treatment used for severe skin diseases. Consists of ingesting plant-derived compounds called psoralens and then exposing the skin to UVA (long wave ultraviolet radiation). Excimer Laser Treatment Delivers targeted narrow-band UVB to affected areas. Pulse Dye Laser Treatment Broken veins on the face, often part of rosacea, as well as portwine stains, hemangiomas in children and red-spots on the body in adults all can be selectively destroyed. The practice offers two categories of treatment using ultraviolet light: Narrowband UVB phototherapy and PUVA phototherapy. These are both used as treatment for psoriasis, eczema, vitiligo and other less common conditions. The practice also offers pulse dye laser therapy for port wine stains and spider veins on the skin. In addition, patients with sensitivity to sunlight are seen for evaluation, testing and treatment. Dr. Elisabeth Richard has been with the practice since 2009. The practice was founded in 1985 by Dr. Warwick Morison and has been located at Johns Hopkins at Green Spring Station since 1997. Drs. Richard and Morison worked together to care for patients until his retirement in 2015. Dr. Richard was born and raised in the Philadelphia suburbs, and moved to New England to attend Middlebury College in Vermont where she majored in Biology. Prior to medical school, she moved to Boston and worked in research at Dana Farber Cancer Institute as well as in public relations for the biotechnology industry. She graduated in 2001 from the University of Massachusetts Medical School, and moved to Maryland to train in Dermatology at Johns Hopkins Hospital. It was during Dermatology training at Johns Hopkins that she met Dr. Morison and became interested in the therapeutic potential of light. 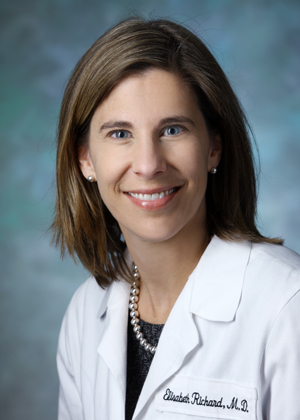 She joined the Johns Hopkins faculty in 2005, and continues to work part-time for the Department of Dermatology, educating residents and practicing general dermatology. "In dermatology, so many diseases that have been otherwise difficult to treat respond to ultraviolet light therapy. By specializing in this unique area of dermatology, my greatest professional satisfaction comes from using ultraviolet light to successfully treat patients that have otherwise failed prior therapies. These successes yield such tremendous benefits to patients and their quality of life. Knowing I have the knowledge and tools to change someone's life inspires me to give my best." GOOGLE MAPS USERS: Google Maps' directions to our offices are potentially misleading. Google Maps' directions will send you to the main entrance of the Hopkins campus on Falls Road; our offices are located in the complex of buildings on the campus. We are not located directly on Falls Road! FINANCIAL INFORMATION: Co-pays are due at the time of service. Please note that our current financial policy requires that you keep a valid credit card on file with our office. Once your insurance carrier has processed the claim(s), this credit card could be charged for any deductibles, co-insurances, or unpaid balances for services rendered to/for the person receiving the medical care. If your account has not been settled within 30 days of statement date, the Practice reserves the right to charge the outstanding balance of patient responsibility to the credit card on file for your account. Payment is also required in full for all cosmetic and/or non-covered services at time of service. If your insurance requires a referral from your primary care physician, it is your responsibility to bring the referral. The practice does not participate with any Medical Assistance programs. If the practice does not participate with your health insurance and/or you do not have health insurance, payment is required at time of service. From the Beltway (I-695): Take Exit 23B onto Falls Road. Make the first right onto Joppa Road and the second left onto Station Drive. Turn right at the "T" intersection (you are looking at the Foxleigh Office Building) and curve around Foxleigh to the four-story building on your left, Pavilion II. From the city: Take the Jones Falls Expressway (I-83) north past the exits to the Beltway until the Expressway becomes Falls Road. Make the first right onto Joppa Road and the second left onto Station Drive. Turn right at the "T" intersection (you are looking at the Foxleigh Office Building) and curve around Foxleigh to the four-story building on your left, Pavilion II. We are in Pavilion II on the 3rd floor, Suite 355, and the elevators are in the center of the building. The MTA Bus 60 from Reisterstown, Maryland stops on the campus of Green Spring Station. There is free shuttle bus for patients that runs hourly between Green Spring Station and the Johns Hopkins Outpatient Center in downtown Baltimore.